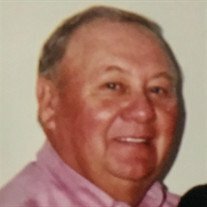 Coy L. Dalton, age 78 of Rutledge, went to be with the Lord on Tuesday, September 18, 2018, at his home surrounded by his family. He was a Deacon at Hubert's Chapel Church in Mooresburg and a life-long farmer. He was preceded in death by his parents Corneilus and Velva Dalton; brothers Claude, Carson, Bill, Paul, Ray, and Kermit Dalton; sisters Katherine Garland, Berneice Thomas, and Mary Ruth Dalton; grandson Dustin Dalton, great-grandson Aiden Dalton, and granddaughter-in-law Kristy Best. He is survived by his loving wife of 59 years Earlene Jarnigan Dalton of Rutledge; daughters Edwina (David) Bean, Belinda (Tim) Nicely, and Veronica (John) Phillips; son Anthony Dalton and fiance' Valerie Jarnigan; grandchildren T.J. (Lindsey) Holt, Chase (Meghan) Nicely, Sierra (Nathan) Finley, Coty Dalton, and Tanner Phillips; five step-grandchildren, six great-grandchildren and one step-great-grandchild; sisters Edna (Delmer) Welch, Doris Diamond, Elora (Joe) McAnally, Jeanette (Elmer) Owens, L.C. (John) Shortridge; brother Wayne (Inez) Dalton; special brother-in-law Eddie Jarnigan and wife, Vicki; special friend Doris Laughner; and a host of beloved nieces and nephews. The family wishes to thank Smoky Mountain Hospice for their kind and loving care. The family will receive friends from 5:00 to 8:00 pm on Saturday, September 22, 2018, at Smith-Reagan Funeral Home. The funeral service will be held at 1:00 pm on Sunday, September 23, 2018, at Smith-Reagan Funeral Home Chapel with Revs. Lyndell Welch, Tommy Frye, and Bob Davis officiating. Interment will follow at Dalton Cemetery in Bean Station. Pallbearers will be T.J. Holt, Chase Nicely, Coty Dalton, Tanner Phillips, Brent Diamond, and Bryant Dalton.